Grading old half dollars is a process presented in the videos. Evaluate and judge these coins with additional images and descriptions. Accurate value depends on accurate judgment of condition. Under grading and optimistic grading are controlled by taking a conservative approach. Collectors and dealers always determine the condition of every half dollar, assign a "grade," and then place a value. You can do the same. Attention to detail is highlighted in the above image. Notice the full "Liberty" on the headband. Although a small part of the design to the Barber half, it is however the difference placing the coin in the Extremely Fine grade. Most Barber halves are very worn, collectors welcome lightly circulated examples placing a value over $100 for such coins. 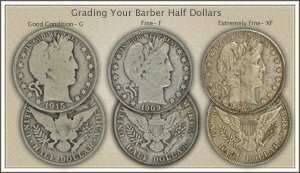 Two main grades of Barber half dollars have the greatest impact on value; the Good grade and the Mint State - Uncirculated grade. Judging your coin as better than Good condition increases its collectability above bullion silver value. Additionally recognizing your coin as Uncirculated places it solidly in the top end of the grading scale. The important points to consider when judging condition are covered in the video. Also images and descriptions are used to highlight the process to grading. 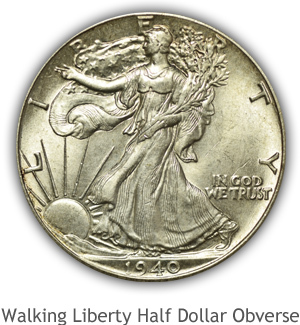 Popular today with collectors, a deliberate effort grading the condition of your old Walking Liberty half often discovers something special. 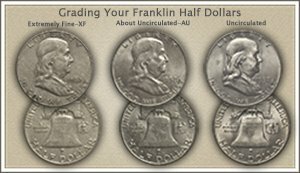 In the grading video - watch closely the difference between an "uncirculated" and "about uncirculated" Franklin half dollar. 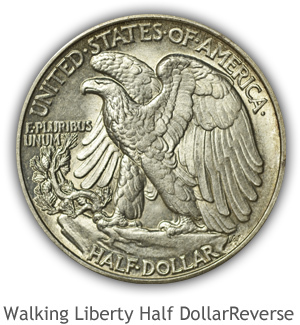 Half dollars are an important field to coin collecting. Many collectors are in the process of assembling sets. 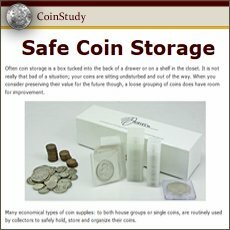 Close attention to the condition of the coins is foremost. Grading half dollars is one element closely studied. Helping with the judgement of coins is an understanding of the full design details to a coin in the condition it left the mint. What elements are missing due to wear is key to the grading procedure. 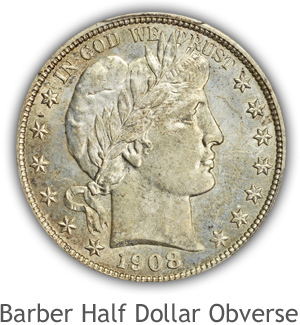 Liberty fills the obverse of the Barber half dollar. She is wearing a Liberty cap and laurel wreath. 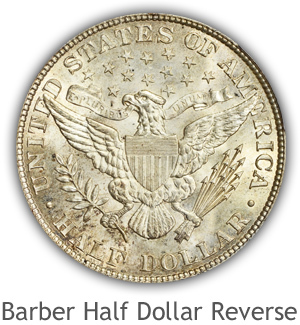 As you begin to grade your half dollar review the image of a mint state Barber half. Liberty's cheek and laurel wreath are very high in profile. Design elements of the wreath are easily worn on first contact. A full design of the wreath shows each leaf is separated and most have a deep central line. Outer edges of the leaves are raised from the concaved middle, and also a distinct high to low curl. Notable to the band is a raised top and lower edge and all seven letters readable. Another element displaying fine detail is the ribbon tying the wreath. A well-defined knot with two trailing ribbons is bold from the field giving dimension to this part of the design. Just above Liberty's eye is a wave of hair defined by fine strands and further above is a band with "Liberty" inscribed. High in profile, finely detailed and first to judge is the hair, wreath and ribbon. An eagle with central shield and outstretched wings covers the reverse design. Mint state - uncirculated examples are full of subtle details. Grading worn half dollars is a process of identifying the amount of wear removed from the original design. Small elements of design are found depicting the feathers of the eagle, lines within the feathers and each feather separated. Detail extends to the high and low "wave" of the ribbon in the eagle's beak. Filling the shield are raised lines both horizontal and vertical. An up-close look at the arrows in the eagle's talons finds very fine detail in both the tips of the arrows and the feathers. Walking Liberty is very bold from the field. She is wearing a well detailed gown with the US flag as its design. Raised lines define the different strips to the flag across her arms and legs. Flowing in front of Liberty, stars are seen in the design of the gown. Held in the left arm are branches of both oak and laurel. Very fine details are observed within the branches on mint state graded coin. Liberty is striding towards the sun, depicted with rays fully bold and rounded from the field of the coin. A striding eagle with arching wings is highly detailed on the reverse. Feather detail is bold on the eagle's breast, legs and the wings have clear rows of feathers. Talons of the eagle are well detailed and boldly separated from the rocky ledge. Finest of detail is found depicting the Mountain Pine tree forward of the eagle. Needles, cones and twisted branches are fully raised and contoured. One note to grading old half dollars; depth of strike on the original coin is often soft in areas of highest detail. Liberty's hand on the obverse is an example. Many coins are lacking full details to the fingers and thumb. A circulated, worn coin lacking detail in the hand area is graded judging the entire surface. The focus in grading Franklin half dollars is determining the mint state grade. Popularity of circulated examples is not as developed in the collecting community as mint state collections. Original detail on the Franklin half dollar is bold with high and low contours defining much of the design. The amount of fine line detail is less than earlier half dollar series. Franklin's cheek is separated from the jaw by a lower relief area. Franklin's hair is also defined by deep shallow areas portraying the waves. Small strand detail within the hair is confined to the higher contoured areas of the hair. On well struck examples small details are seen at the top of the hair. As part of Franklin's coat is a rounded collar and suggestions of the shirt. His shoulder is marked by the raised edge to the field to the coin. The Liberty Bell is the main devise of the reverse. Across the bell; lettering of the inscription is often weak because of softness of strike. Across the lower edge of the bell is also an area of grading focus. Fine raised horizontal lines are quick to shows signs of wear and due to weakness of strike, often incomplete. 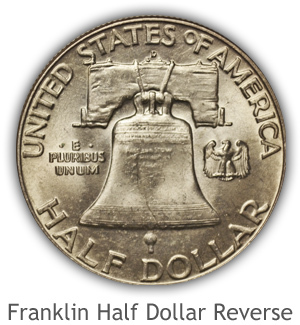 Franklin halves require careful study of mint state coins to accurately judge for condition. Fading of the small details in many cases is not the result of wear. A good judge of condition relies on the presence of mint luster. Finding a well struck Franklin half in the mint state grade is a premium value coin. These minimum half dollar values are current as of 4/15/2019 and silver is $14.90 per ounce. Here are examples from a few series. Later date Barber half dollars, heavily worn and graded as "good" condition are worth$8.91 each. In "fine" condition every date is a valued collectible. Pull from your coins any Barber half with a full "Liberty" visible in her headband. All in this condition or higher are worth a collector premium. 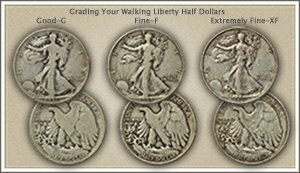 Walking Liberty half dollars start at $6.52 any in the "extremely fine" grade is now a $9.78 or higher valued coin. If hair detail remains and there is a separation of hair from Liberty's forehead you have a higher grade coin. Many dates and mints are valued above minimum bullion silver value. 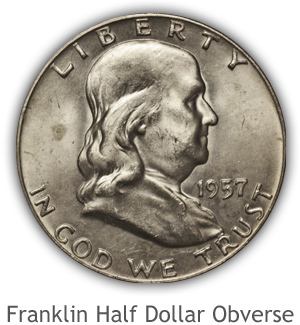 Many Franklin halves move up and down in value with changes in silver price. All are now $5.60 with a few higher because of their condition. Grading these is becoming important to separate the premium coins. Inspect the reverse, look for the inscription on the bell. A lightly worn or better condition Franklin half still has lettering intact on the Liberty Bell. A few earlier dates are becoming collectible in circulated grade, breaking above base silver value. It is not always the combination of date and mintmark raising your old half dollars to the scarce and valuable level. Often it's your coin's condition, or "grade" as referred to by collectors. Avidly sought are nice quality examples (of any coin series) to add to collections. How-to-videos detail the subtle insights into grading not only half dollars but the condition of all your old coins. Grading half dollars plus the coin's date and mintmark all combine to determine value. Charts list the different series, covering Bust halves to the vintage Franklin halves. 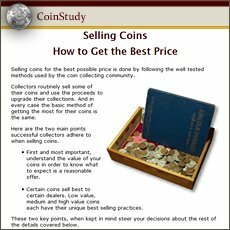 All old US coin values. It is an excellent index with images and text links to all coin series, from Cents to Gold. Half Dollar value charts, grading images and descriptions uncover how much your box of old coins is worth.